Madhugiri, a popular tourist destination lies in the district of Tumkur in Karnataka. Asia’s second largest monolith, Madhugiri stands at a height of 3930 feet. A rock dome is the highlight of this place and fort stands on top of it. 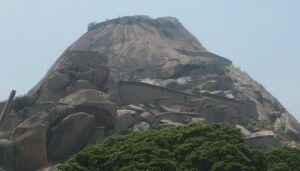 The climb is quite steep and there are three gateways to the fort. A ruined Gopalakrishna temple lies on top of the hill. 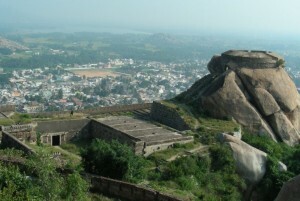 Madhugiri fort has great historical importance and was originally constructed in the17th century by Raja Hira Gowda. The magnificence of this fort has been attracting tourists from far off places. 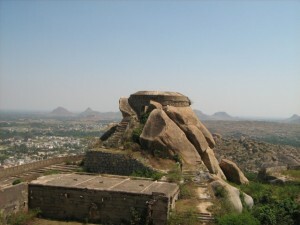 Malleswara and Venkataramana are two temples situated in Madhugiri and a Jain temple is also seen within the fort. Malleswara and Venkataramana temples are quite famous for its Dravidian style architecture and lofty towers and are quite popular among tourists.